Prevent chafing and sweat rash in style! 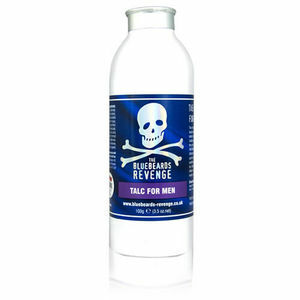 The Bluebeards Revenge Talc goes further to promote the case for talc than ever! Incorporating some inspirational ingredients including cooling cucumber extract, soothing aloe vera and silky shea butter, it gets to work in all the areas where sweating can cause chafing and rashes to prevent irritation. Better still, the talc also includes a little maca oil—according to Inca folklore, this is an ingredient that has a positive effect on virility! £5.99 (inc. VAT) Why no VAT? We're a trade wholesaler and quote our prices without VAT to help our VAT-registered customers understand the true cost of a purchase. Smart-looking talc blower that dispenses talc in measured puffs. Available in a classic black design with a silver head.